In my 31 (almost 32 yikes) years on this earth I have done a lot of crazy and wild things to my hair. 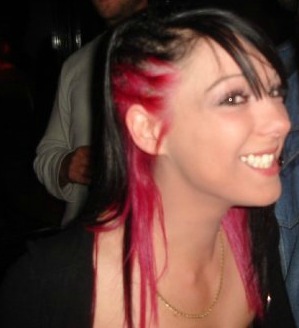 I have been dying my hair since I was about 14 years old, I blow dry daily, flat iron daily and have put my hair through years of abuse from extensions to bleaching it to have some pretty funky colours like the picture below when I had hot pink hair! I actually miss that hair colour, I met Steve when I had pink hair – poor guy! I can still remember the hours it took my girlfriend Sandra to bleach out the black from my hair to be able to get it light enough to dye it that colour. We honestly though my hair was going to fall off that is how many times we bleached it! Fast forward some years and I no longer bleach my hair but I still put it through some grief by blow drying and straightening it several times a week and it does take its toll. Some days I find my hair very dry and I tend to lose a lot of hair, I shed worse than Reggie our cat! I also find if I don’t wash my hair daily with the products I was using it would tend to get real greasy, real fast. I am sure you can imagine my problem as a new mom I am lucky to get a shower daily, many times I only have time for a quick neck down wash and out. I was excited to try out Boo Bamboo’s Strengthening Shampoo and their Strengthen & Shine Conditioner as I have heard it works wonders but I wasn’t quite sure it was going to stand up to these locks! You can say goodbye to dry brittle hair with Boo Bamboo’s Strengthening Shampoo is a bamboo extract enriched formula that drenches your hair with organic proteins and silica to help strengthen your hair and create brilliant shine. It gently cleanses without stripping away your color, leaving you with incredibly soft healthier looking hair. I was really impressed with this shampoo, it definitely got my hair super clean and the scent is really light. I knew I would have to put it through the “I am a new mom, what is a shower test” and my hair actually took twice as long as normal to get to that point of “okay I need to throw it up in a pony”. I like the fact that it won’t strip away my colour because believe it or not I actually NEED to colour my hair now. 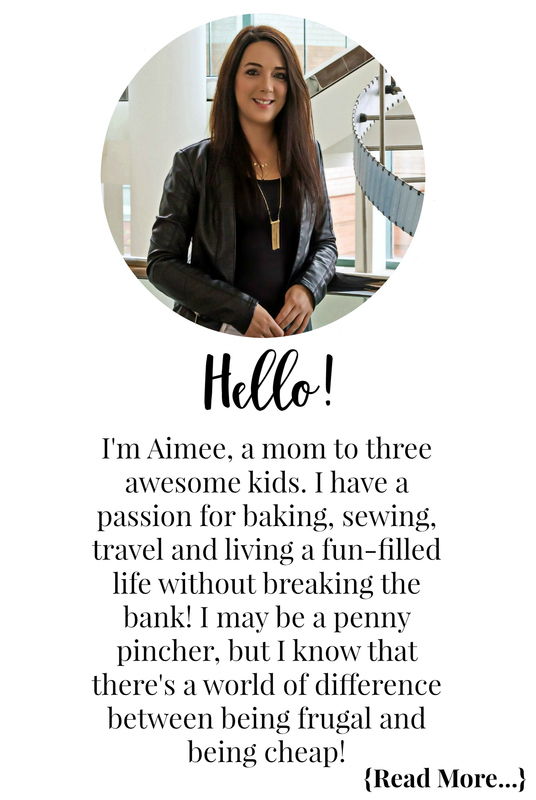 What was once just a fun thing to do is now a necessity unless I feel like walking around town looking more like a grandma than a young mamma that is how much grey hair I have – KIDS! This conditioner is amazing, it it thick but yet rinses out with ease. It left my hair incredibly soft I didn’t even have a hard time brushing my hair out, there were no knots and no straw-like patches! I can definitely see a great improvement in my hairs appearance and feel. It seems stronger and I am no longer shedding more than the cat. The conditioner has a soft scent, the same as the shampoo and it isn’t overbearing and I think that is a huge factor in it not drying out my hair. Scrub away dry, dead skin cells with this daily body polisher that exfoliates to reveal a healthier, more radiant new you. Its rich lather and bamboo exfoliating powder wash away pollution and oily build-up while the silica and organic proteins restore your skin’s natural moisture balance, so you’re off to a fresh start. I suffer from very dry skin, I battle the scaly legs, dry hands and elbows too. I normally have to use a salt scrub on my legs and arms to achieve soft skin, something I haven’t been able to achieve before with just a body wash and lotion. The Boo Bamboo Exfoliating Skin Refining Body Wash has become my new favourite body wash. Its light fresh scent and amazing exfoliating qualities have improved my dry skin. I now can just lotion after a shower and not be left with scaly legs instead of having to scrub my legs with the salt scrubs I was using. Gently removes makeup and dirt while toning skin in one easy step. Organic Bamboo extract enriched formula is mild enough to use multiple times a day. 100% Bamboo wipes are lint free, unbleached and biodegradable. I love makeup removing wipes, as a busy mom sometimes I only have time for the neck down shower and I will use wipes to remove my makeup before getting in, then again when I get out to get any remaining stuff off. They’re quick and easy, especially on-the-go! I also like using them even before I wash my face with a cleansing gel because it helps remove some of the tougher makeup residue. These wipes have helped improve my skins appearance and I have noticed less pop up acne too! You can find their products online at Well.ca or in your local Walmart, Organic Garage and Rexall Stores. 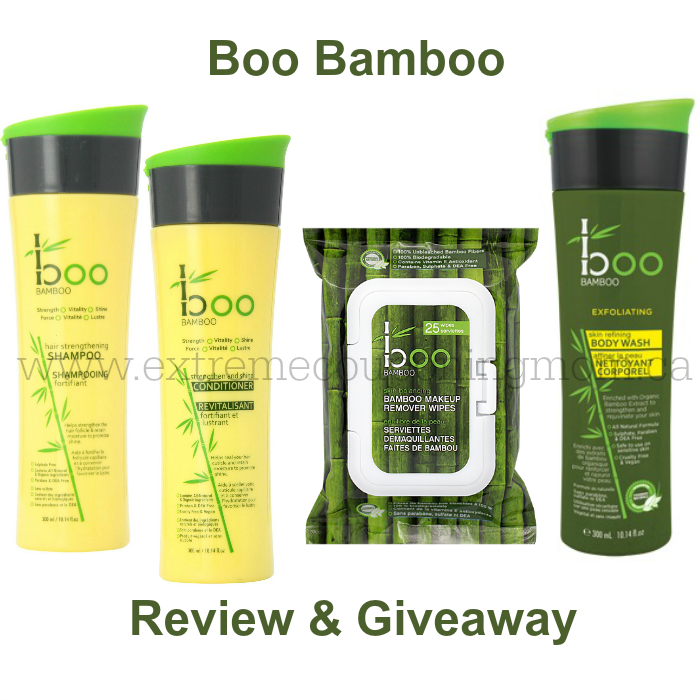 Boo Bamboo has generously offered to give away a prize package to one lucky ECM reader containing the products in my above review, enter below for your chance to win! Disclosure: Boo Bamboo provided me with the above mentioned product and prize in order for me to complete this review/post. Even though I was given a product for this review/post I always give my honest opinions, findings, beliefs, or experiences. The views and opinions expressed in this post are purely my own based on my research and experiences. Any product claim, statistic, quote or other representation about a product or service should be verified with the manufacturer, company, provider or party in question. Cool giveaway! This would be so awesome to win. I would love to try the Exfoliating Skin Refining Body Wash. The Bamboo wipes are what I am most excited to try as you comment they remove makeup while toning the skin. I would love to try Boo Bamboo Strengthening Shampoo. Love their products. Most excited to try the Body Wash! Great contest ! I have never tried these products before but I would love to.I will look for them next time Iam at Shoppers. I`d like the wipes, a busy persons bf! We are always looking for good hair products. My daughter is 11 and grows her hair to donate for cancer patient wig. She just did it for the 3rd time. I’ve never heard of this brand, but will be searching it out on Well.ca now !! I’d like to win this for myself, the body wash sounds great.. I would like the makeup remover wipes. I am most excited to try the conditioner, because I could really use a good one. I am most excited to win the Exfoliating Body Wash. I would like to try their conditioner! 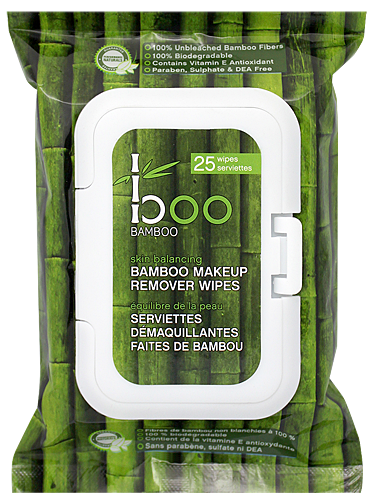 The bamboo makeup remover wipes would be my pick. I’m most excited about the make up remover. I’d love to try the makeup remover wipes. I would love to try the makeup removing wipes. I am most excited about the makeup remover wipes. The Boo conditioner is what I’m most excited to try! My hair gets so dry and I hate brushing it out after I wash it! I’m most excited to try the shamppo and conditioner. I am most excited to win the shampoo because I am always looking for a good shampoo. Thanks for the chance! I would love to try the makeup remover wipes! They would be so handy for me to take to work, keep in my purse on a night out or when I go on travel! I’m most excited to try the conditioner!! My hair is dry and I would love to see if it will hydrate. I would like to try the exfoliating body wash! The makeup remover. It’s so hard for me to find a good one thats soft on my skin. I would like to win the makeup remover wipes! I am most excited about the Boo Bamboo Exfoliating Skin Refining Body Wash.
Really excited to try these products after reading your review! Good to know they are only lightly scented……been curious about this brand for some time!